Line from the film: "Let's face it: he made the best monster movies of all time"
Over the past few years, I’ve covered a good many of Ray Harryhausen’s films, and have several more to go (I plan to squeeze each and every one of his movies in before I hit the 2,500 mark). What he brought to each of the pictures he worked on was more than simple animation (or “Dynamation”, as he called it); every single creation of his had its own distinct personality, from Mighty Joe Young straight through to Medusa in Clash of the Titans. They were alive, and even if you knew in the back of your head that were watching latex-covered armatures moving about, you were drawn in so deeply that, in the moment, you believed these monsters were 100% real. 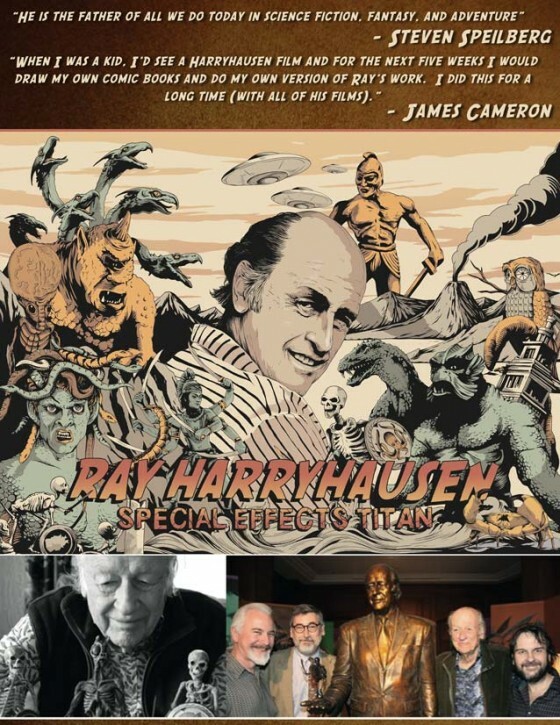 That is the magic of Ray Harryhausen, and the 2011 documentary Ray Harryhausen: Special Effects Titan is both a tribute to this extraordinary talent and a reminder of the impact his hard work and imagination had on the motion picture industry as a whole. Mesmerized by King Kong when he was a boy, Harryhausen began making first his own creatures, then his own films (early dinosaur tests, etc). As a teenager, he arranged a meeting with Willis O’Brien. the special effects wizard behind Kong, who was impressed enough with what he saw that he eventually gave the young man his first motion picture job: as an uncredited “technician” on 1949’s Mighty Joe Young (despite his lowly title, it was Harryhausen who animated about 90% of the movie). In addition to his backstory, Ray Harryhausen: Special Effects Titan takes us through each of his films, complete with trailers, clips, and still photos (many of which were provided by Harryhausen). We also hear from some of the actors and actresses who worked on these movies (including Martine Beswick and Caroline Munro), all telling how Harryhausen was an integral part of the entire process (early in this documentary, he says he considers himself not an animator, but a filmmaker, and was involved in everything from the initial concept to promoting the finished film). In addition, we meet the directors who were inspired by his movies: Peter Jackson, Guillermo del Toro, Terry Gilliam, James Cameron, John Landis, Joe Dante and Tim Burton. Steven Spielberg was interviewed as well, declaring at one point that Harryhausen was “The father of all we do today”, and says everyone working in fantasy and sci-fi owes something to him. In addition, some modern special effects gurus (Dennis Muren, Steve Tippett) heap praise on the man, as do animators like John Lasseter, Henry Selick and Nick Park (Selick and Park have picked up the stop-motion torch and keep it burning brightly). All of these personalities have, at one time or another, drawn influence from Harryhausen’s pictures (Cameron admits the look of the titanium Terminator was inspired by the skeletons in Jason and the Argonauts). My favorite scenes in Ray Harryhausen: Special Effects Titan, though, are when we’re given a behind-the-scenes look at his methods, including the set-ups he used to make it appear as if The Beast from 50,000 Fathoms was tearing apart a city street (a complex process involving rear projection and panes of glass). I admit I got a bit giddy when I saw the original model for the Medusa from Clash of the Titans (my all-time favorite Harryhausen monster), and the super 8 films taken on the set of The 7th Voyage of Sinbad were a lot of fun. It’s wonderful that many of his creations are still around, and in the final part of this documentary, we hear how the Ray and Diana Harryhausen foundation is working to preserve these priceless cinematic artifacts, and how guys like Peter Jackson are donating their time to help this extremely worthy cause. Ray Harryhausen is no longer with us (he passed away in May of 2013), but his movies are, and I recommend you watch all of them. While you’re at it, also check out Ray Harryhausen: Special Effects Titan, too. As film-centric documentaries go, you couldn’t ask for a better subject!